Winter is well and truly upon us as Scorpio moves to prominence in the sky. There is little or no need to have to point out that the symbol for this sign is the legendary Scorpion. The Greek legend goes that the hunter, Orion, was all powerful in his control of the land. He stated that he could take on and slay any beast in the land, and he proceeded to hunt down every animal. Unhappy with the killing, the god Artemis sent the giant scorpion to fight and beat Orion, which it did. That’s why when the constellation of Scorpio (or Scorpious as it is also known) rises to prominence, Orion fades away. That is the enduring power that this constellation still carries. 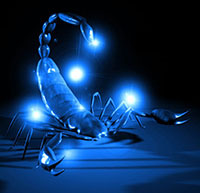 One of the most striking things about Scorpio is the curved tail of bright stars that distinguishes it. This is surely an aspect that caught the eye of ancient stargazers. The twin Sco stars are the brightest, and they help the ‘hook’-like formation of the tail to stand out. Those who are born when this constellation is at prominence often have a combative streak in them. They do not shy away from trouble, but instead reach out and embrace challenges. 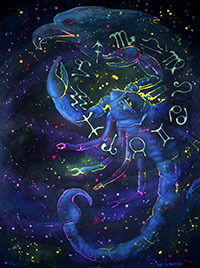 This can be in a very broad variety of ways, from taking on injustice to standing up for themselves; this is a characteristic that dwells in almost every Scorpio. Part of this forwardness is a connection with the physical. There tends to be a love of sport, of exercise, or challenging oneself in Scorpios. Although it doesn't manifest itself in everyone born under this sign, it nevertheless seems that Scorpios tend to like to use their bodies and enjoy the benefits that come from a vigorous lifestyle. The slightly daredevil nature of Scorpios often makes them the life of the party. They take risks and put themselves out there much more so than many other signs. This is all part of what makes them an assertive sign. Scorpio is a Water sign, but this shouldn't be interpreted as thinking it’s in any way an overly soft sign. Collective: We refer to those who are born under this sign as Scorpios. A Negative Aspect: When you get on the wrong side of a Scorpio, it can be hard to find a way back. Unfortunately, grudges tend to be relatively common with people born under this sign. Even when an issue is resolved, and friendship is regained, there can be lingering difficulties with Scorpios. They simply find it hard to let go, as it runs contrary to their assessment of the person in question. Many Scorpios manage to get past this trait, but it nevertheless is an aspect that tends to run through those born under this sign. Famous Scorpios: Walter Cronkite, Leonardo Decaprio, Jodie Foster, Robert Kennedy, Joni Mitchell, Pablo Picasso. Is Scorpio your sign? Do you feel you need help understanding and getting the best of your horoscope? If so, I can help you. I agree with a lot of what you stated. Good article. This is so true, I have first hand knowledge as all 3 my children and my son in law are Scorpios. I am born on the 22 of November. To my knowledge I am therefore Ophiuchus, the constellation between Scorpio and Sagittarius. The muscular man and the snake. Have you any further information on this hidden Zodiac? I beleive in Wicaa so much it has transformed me and love 7witches.com that it has enlightened me to see another way that is truely me. I need to know if by early 2016 my financial situtation will improve.Thank you. I beleive in Wicaa so much it has transformed me and love 7witches.com that it has enlightened me to see another way that is truely me. I need to know if by early 2016 my financial situtation will improve.Thank you.I was born Nov 20 1955 at 3:34 pm. I was born in Muncie, IN at 6:02pm on Salheim 1969. I have been awakened. The next-level of human evolution is currently underway. I am not COMPLETELY sure how I am a part of this. Cause if what I'm feelin is True... I, uh, I am really NOT that important. But the synchronicities that I can no longer deny... But it DEFIES all natural logic.